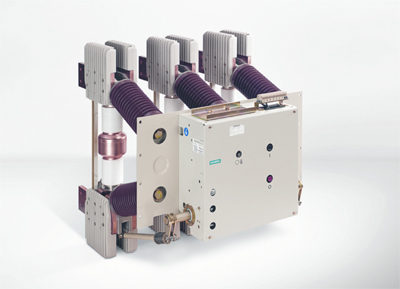 In Vacuum circuit breakers, vacuum (degree of vacuum being in the range 10-7 to 10-5 torr) is used as the arc quenching medium. Since vacuum offers the highest insulating strength it has far superior arc quenching properties than any other medium. 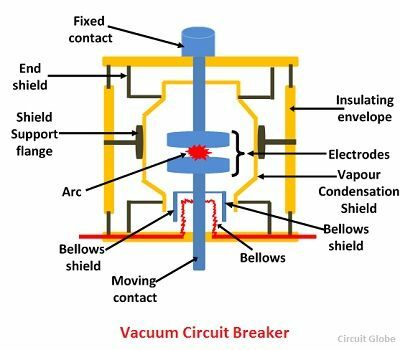 For example, when contacts of a breaker are opened in vacuum, the interruption occurs at first current zero with dielectric strength between the contacts building up at a rate thousands of times higher than obtained with other circuit breaker. When the contacts of the breaker are opened in vacuum (10-7 to 10-5 torr), an arc is quickly extinguished because the metallic vapor, electrons and ions produced during arc rapidly condense on the surface of the circuit breaker contacts resulting in quick recovery of dielectric strength. As soon as the arc is produced in vacuum, it is quickly extinguished due to the fast rate of recovery of dielectric strength in vacuum. Above figure shows the parts of a typical vacuum circuit breaker. It consist of fixed contact and arc shield mounted inside a vacuum chamber. The movable member is connected to the control mechanism by stainless steel bellows. This enables the permanent sealing of the vacuum chamber so as to eliminate the possibility of leak. A glass vessel or ceramic vessel is used as the outer insulating body. The arc shield prevents the deterioration of the internal dielectric strength by preventing metallic vapors falling on the surface of the outer insulating cover. When the breaker operates, the moving contact separates from the fixed contact and an arc is struck between the contacts. The production of arc is quickly extinguished because the metallic vapors, electrons and ions produced during arc are diffused in a short time and seized by the surface of moving and fixed members and shield since vacuum has very fast rate of recovery dielectric strength. The arc extinction in a vacuum breaker occurs with a short contact separation say 0.625 cm. They are compact, reliable and have longer life. There are no fire hazards. There is no generation of gas during and after operation. They require little maintenance and arc quiet in operation. They can successfully withstand lightning surges. They have low arc energy. If you are struggling to buy the highest quality and reliable Boltswitch 240 Volt and 600 Volt Circuit Breakers to suit your electrical needs, then All Electric Needs Inc. is the right place for you.